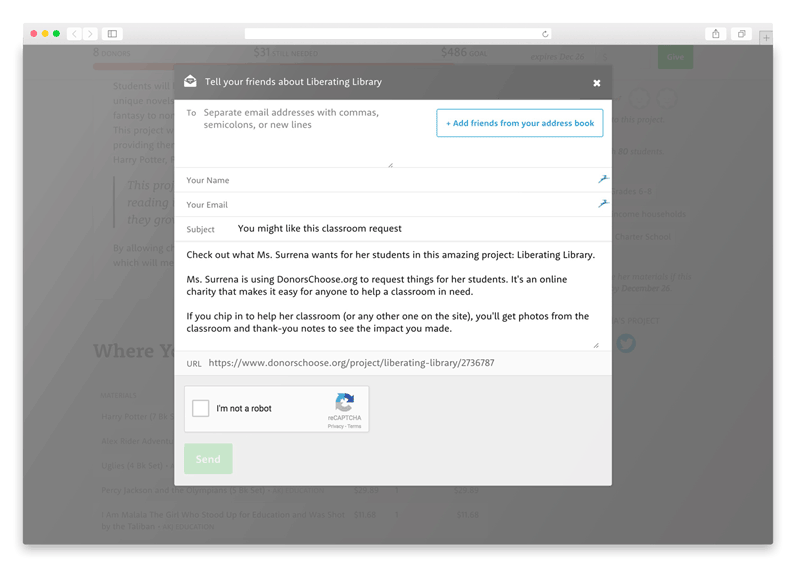 DonorsChoose.org, the crowdfunding platform that helps teachers and educators raise money for classroom projects and education materials, wanted to improve the success rate for teachers using the fundraising site. The DonorsChoose.org Product & Engineering team analyzed user activity and found that when teachers shared their crowdfunding request with their network of friends and family, they were far more likely to reach their funding goals. In response, the team began to search for ways to improve the platform and make donor solicitation and project sharing an easier and more seamless part of the user experience. DonorsChoose.org was founded in 2000 by Bronx teacher Charles Best who believed that there were plenty of people who would be willing to help fund classrooms in need if they knew where the money was going. He started a website where teachers request support for classroom resources and experiences. The concept caught fire, and it wasn’t long before teachers across the country were using the crowdfunding site to improve education in classrooms across America. In 2007, backed by additional funding, the website was opened to every public school in the United States. Remarkably, at least one teacher at 75% of schools in the US has created a project on the DonorsChoose.org platform. More impressive is the amount of money that DonorsChoose.org has helped funnel into classrooms across the country since its inception. To date, the website has raised over $550 million dollars with almost a million projects funded on the platform. In the last year alone, DonorsChoose.org has raised over $100 million dollars for students and teachers in need of additional funding. The site has impacted the quality of education for more than 24 million students in US schools. DonorsChoose.org helps classrooms seeking funding on the platform by connecting them with two major sources of support: 1) individual “citizen” donors and 2) corporations and foundations looking to make an impact in classrooms. About half of all donations, Pearsall explains, comes from corporation and foundations such as Chevron, Google, and the Bill and Melinda Gates Foundation. “These sponsors will often fund projects to make an impact in their communities or match existing individual donations to meet funding goals,” says Chris Pearsall, VP of Brand and Communications. “The other half of funding comes from individual donors just like you or me giving $5 or $10 dollars at a time because they find a project that inspires them,” explains Pearsall. Connecting classrooms with individual donors in combination with matching donations from larger organizations is the true power of a platform like DonorsChoose.org. “We see ourselves as different than other crowdfunding platforms because we’ve built a community of people and organizations who want to support education, even if they don’t know the teacher they’re helping,” says Pearsall. More than half of individual donors come from the immediate network that’s locked away in email address books and contact sources. “We see that just over 50% of our individual donors know the teacher they are supporting,” Ho adds. That makes a smooth and seamless contact importing process essential to the early success of a project, providing an initial boost of donations and wider access to funding sources through the DonorsChoose.org site. Providing opportunities for teachers and donors to easily share projects with their email contacts led to increased project success. The benefits of contact importing seemed obvious–giving users access to contacts in their address books or contact sources would encourage more sharing and more accurate information. The improved volume and reliability in sending donation requests was likely to significantly increase donations. The “build or buy” discussion familiar to almost any engineering team began to point to finding a vendor to provide integrations with some of the most common contact providers such as Gmail and Yahoo: “We’re a nonprofit and even though we have this awesome engineering team we are small. We have fewer than 20 engineers, so when it comes to time spent completely hand rolling a product like this, we don’t have the resources to do that and do everything else we need to do for our site,” Ho explains. In 2012, DonorsChoose.org implemented CloudSponge and had the integration completed and quickly rolled into production, reducing the project timeline from months to weeks. “It was not a huge project and fairly simple to integrate,” says Ho. Those opportunities were then added to various places across the site, including the project creation workflow, project description, donors’ thank-you page, and more. The added opportunities gave donors more chances to connect their network with teachers in need. 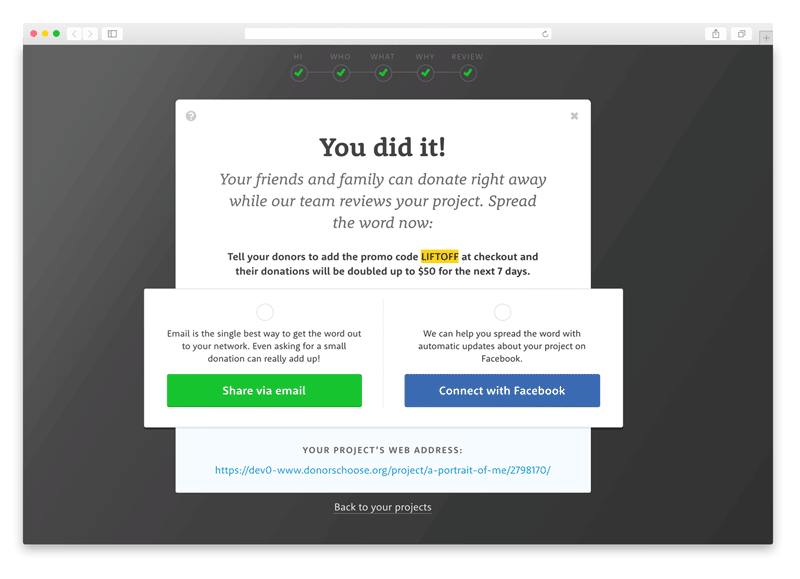 More emails means greater awareness for projects, which means more donors and more frequent donations. As a result, Ho implies, more projects are funded, and more materials are provided for students. “It’s absolutely had an impact,” Ho adds. All in all, the CloudSponge implementation allowed DonorsChoose.org to focus on their core business and drive bottom-line metrics that make a difference in classrooms across America. DonorsChoose.org is a 501(c)(3) nonprofit organization that allows individuals to donate directly to public school classroom projects. Help teachers and donors more easily share projects with their personal networks to improve funding success.